Our Ato 3 Seat Chaise Sofabed features a chaise seat that can be located on any of the three seats of the sofa, it's also easy to change the position of the chaise seat in the future if you change the configuration of your sofa. 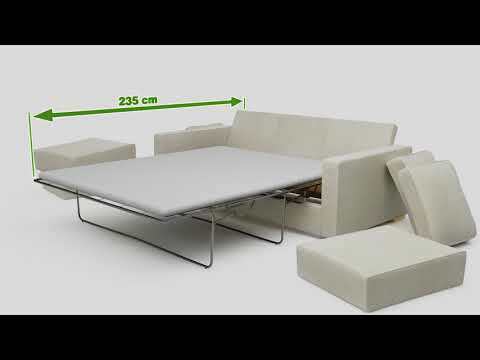 This chaise sofa bed also has a threefold metal action double sofa bed mechanism which fits in the space beneath the seats, the comfort level to the sofa will not be affected by the bed. The Ato 3 Seat Chaise Double Sofa Bed has its modern looks and will make a strong style statement in any home. It has a comfortable seating to provide a sofa that's truly comfortable to sink back and into and relax. It's easily convertible into extra sleeping space for your visitors; this is designed with multi-functionality in mind. It has this cushioning providing superior comfort and highly practical and served with a contemporary flair. Beautiful sofa and finish, very very comfortable and perfect fit for our lounge. Two adults can properly strech on it. Wouldn't change it for the world! Practical and comfortable - fits well in my flat.